The Cértima River, located in north-central Portugal (Figure 3), is a sub-tributary of the Vouga River, a watercourse that drains into the Atlantic Ocean via the Ria de Aveiro coastal lagoon. The Cértima River has a total length of 43 km, from its headwaters on the west flank of the Buçaco mountain range to its outlet at Requeixo. It drains an area of about 540 km2 that ranges from 4 to 563 m in elevation. In its lower section, the river valley opens broadly to form one of the largest natural freshwater lakes of the Iberian Peninsula (approximately 5.3 km2) - the Pateira de Fermentelos Lake - which is considered a sensitive wetland and is classified as a RAMSAR site. The land cover in the Cértima River Basin consists of a mixture of agricultural lands (44%), forest plantations (48%) and built-up areas (7%) (CLC, 2006; INE-EA, 2011). While forest plantations are dominated by pure and mixed stands of Pinus pinaster and Eucalyptus globulus, the agricultural lands are predominantly permanent crop lands and, in particular, vineyards (27%). The arable lands make up a heterogeneous and complex pattern of annual croplands where mainly potato, corn, oat are cultivated, together with annual and permanent pastures. Animal rearing in the Cértima River Basin is dominated by chicken farms (95%), rabbit (2.2%), pig (1.5%), and cow (0.5%) farms. Figure 3. Geographical setting of the Cértima River Basin, north-central Portugal. Land use practices continue to be highly traditional, involving frequent soil mobilization, limited crop rotation, and excessive use of fertilizers and phyto-pharmaceuticals (INE-EA, 2011). In recent years, however, several of the wine producers that pertain to the Bairrada winegrowing region are increasingly adopting protective and integrated agricultural practices; first and foremost to improve and promote the quality of their products. These integrated agricultural practices comprise, in essence, a substantial reduction in the frequency of soil mobilization operations, including reduced soil erosion risk, sustainable use of fertilizers for ensuring normal plant development, and minimized application of pesticides and herbicides for promoting biodiversity and limiting pollution of soils in downstream aquatic and flood zone habitats (DGPC, 2005). The soils in the Cértima River Basin are dominated by Humic Cambisols in its eastern, upland areas and by Podzols in western parts (Cardoso et al., 1971, using the FAO-2006 classification). These Humic Cambisols are developed from Ordovician schists, whereas the Podzols are formed on modern-age alluvial sands and clays. There is no regular monitoring program for soil quality in place in the Cértima River Basin, in spite of the Portuguese Environmental Agency being officially responsible for evaluating soil fertility and contamination. Following earlier work focusing on surface water quality and the WFD (Cerquieira et al., 2005; Ferreira et al., 2009; Serpa et al., 2014), the nationally-funded VITAQUA project has been studying soil contamination by agri-chemicals including soil erosion and associated transport of agri-chemicals in the vineyards of the Cértima River Basin. To this end, the “São Lourenço” experimental research basin was instrumented with a hydrometric station (including automatic sampler), various rainfall gauges and various runoff plots, and is being monitored on a 1 to 2-weekly basis since 2011. More recently, an innovative field experiment with biochar was started in a vineyeard within the research station of the Vitivinicola da Bairrada (EVB), Anadia. The motivation for this experiment was two-fold, i.e. i) vineyards of the Bairrada region are increasingly experiencing water stress in the dry growing season, and ii), biochar has been found to improve soil infiltration and water holding capacity, thereby not only increasing plant-available water but also reducing soil erosion risk. The experiment’s objectives are therefore to assess the effects of biochar on soil hydrology, soil quality and crop production. Since March 2013, data is being recorded on soil moisture content, soil water potential, soil temperature, and soil electric conductivity. In addition, crop physiological variables such as chlorophyll fluorescence, stomatal conductance, leaf pigment content and hydric stress have been monitored on three occasions. Also, grape yield and aboveground vine biomass data, have been collected by personnel of the EVB (testimony of the interest of both the EVB and the DRAP-C). Finally, a time series of soil samples is being analysed for eco-toxicological effects of applied biochar, in terms avoidance/survival of earthworms, isopods, and springtails. The main stakeholders for the Cértima study site will be the Portuguese Environmental Agency (APA - Agência Portuguesa do Ambiente), Regional Office of Agriculture and Fisheries (DRAPC - Direcção Regional da Agricultura e Pescas do Centro), Estação Vitivinícola da Bairrada (EVB) and Municipalities of Mealhada (CMM), Anadia (CMA) e Oliveira do Bairro (CMOB). Cardoso JC, Bessa MT, Marado MB. 1971. Carta dos solos de Portugal (1:1,000,000). Serviço de Reconhecimento e de Ordenamento Agrário, Secretaria de Estado da Agricultura: Lisboa. Cerqueira MA, Vieira FN, Ferreira RV, Silva JF. 2005. The water quality of the Cértima river basin (Central Portugal). Environmental Monitoring and Assessment 111: 297–306. CLC, Corine Land Cover. 2006. Carta de uso e ocupação do solo de Portugal Continental. Instituto Geográfico Português, Lisboa. Direcção Geral de Proteção de Culturas. 2005. Produção integrada da cultura da vinha, Lisboa. Ferreira RSV, Cerqueira MA, Condesso de Melo MT, de Figueiredo DR, Keizer JJ. 2010. 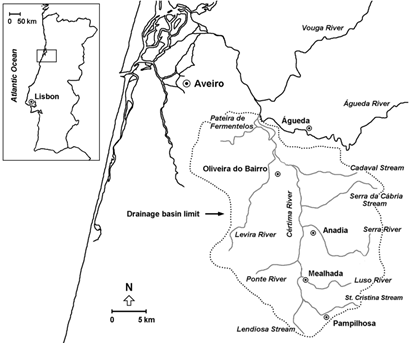 Spatial patterns of water quality in the Cértima River basin, central Portugal. Journal of Environmental Monitoring 12: 189-199. INE-EA. 2011. Estatísticas Agrícolas 2010. Instituto Nacional de Estatística, Lisboa. Serpa D, Keizer JJ, Cassidy J, Cuco A, Silva V, Gonçalves F, Cerqueira M, Abrantes N. 2014. Assessment of river water quality using an integrated physicochemical, biological and ecotoxicological approach. Environmental Science: Processes and Impacts 16: 1434-1444.